1. Premium stainless steel metal link bracelet band mixed with fashion, nobility, durability and elegance. 2. The new updated connector at both ends locks into your iWatch interface precisely and securely. 3. Adjustable iWatch accessory band length. The size can be adjusted according to the circumstance of individual wrist by removing the extra links. 4. Adopt unique dual button folding clasp, firmly closed, and prevent loosen automatically. 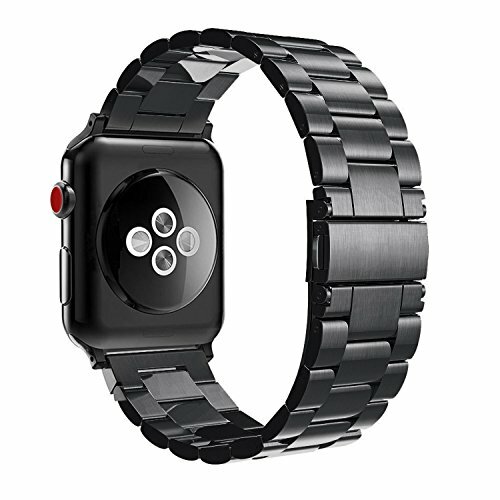 Custom designed for your 42mm Apple Watch Series 3 Series 2 Series 1 Nike+, Sport and Edition with this stainless steel metal replacement Strap (only for all 42mm versions). Wristband for iWatch comes with adapter on both ends, easy to install and remove onto your watch interface. Slide in / out installation. Fits 6.49"- 8.86" (165mm-225mm) wrists. Up to 8 links can be removed with the provided link removal tool.